Overhead line insulators are used to separate line conductors from each other and the supporting structures electrically. Permittivity and dielectric strength of the insulating material are very high so that it can withstand high electrical stress. Insulators protect the transmission line from overvoltages which occur due to lightning, switching, or other causes under the severe condition. 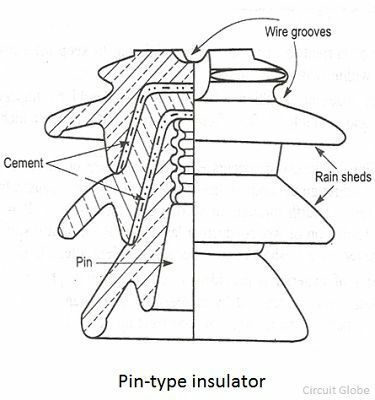 There are three main types of insulation used for the overhead line. A suspension type insulator consists of some separate insulator units connected to each other by metal links to form a flexible chain or a string. The insulator string is hanged from the cross arm of the support. The conductor is attached to the lower unit of the insulator. Strain or tension is designed for handling mechanical stress at angle positions where there is a change in the direction of the line or at the terminations of the lines. For high voltage lines having longer spans and greater mechanical loading, suspension insulator strings are arranged in a horizontal position.